With the 2017 Ford F-150, you get a truck that enhances your hard work. It's designed from the ground up to survive rugged conditions and long hours of labor. Advanced technologies address safety and productivity, helping you to also work smart. Ford offers seven well-equipped models for 2017. Each one is loaded with compelling features, with even more available to further enhance their functionality. The Ford F-150 has a military-grade, high-strength aluminum-alloy body. Not only is this material highly durable, it also helps shed weight for improved all-around performance. Under the skin, the fully boxed frame is 78 percent high-strength steel, and features eight crossmembers, with five of them through-welded. As a result, you get a stronger and more rigid frame. You get five powerful and efficient engines to choose from for this truck. The base option is a 3.5-litre V-6 with variable cam timing. It produces a respectable 282 horsepower and 253 lb.-ft. of torque. For an upgrade, the 2.7-litre EcoBoost uses a combination of turbocharging and direct injection. As a result, it produces 325 horsepower and 375 lb.-ft. of torque, despite being smaller. Even more extreme is the 3.5-litre EcoBoost V-6, which also combines turbocharging and direct injection. It puts 375 horsepower and 470 lb.-ft. of torque at your command, along with plenty of capability. A naturally-aspirated 5.0-litre V-8 is the next option. With a more traditional setup, it whips out 385 horsepower and 387 lb.-ft. of torque. The most powerful option, a High-Output 3.5-litre EcoBoost V-6, is only used on the Ford F-150 Raptor. Peak output is amazing at 450 horsepower and 510 lb.-ft. of torque. All the engines, except for the two 3.5-litre EcoBoosts, work with a 6-speed SelectShift transmission, which has a manual mode. The other engines pair up with a highly advanced 10-speed automatic, which works to keep engine RPMs within an ideal range for excellent responsiveness and fuel economy. Not only is the 2017 Ford F-150 powerful, it can tow quite a bit. 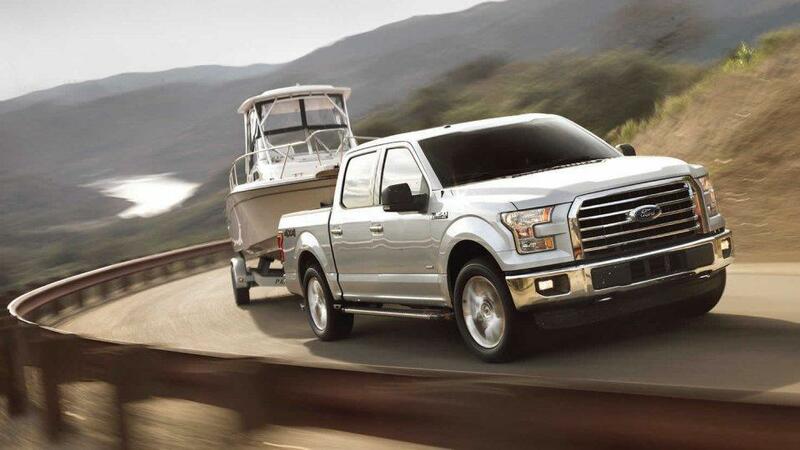 In fact, the truck boasts a maximum tow rating of 12,200 pounds (5,533 kg) when using the 3.5-litre EcoBoost V-6. Several features help with the task of towing, like a Dynamic Hitch Assist system, which makes lining up the hitch ball to the trailer receiver easy. A Smart Trailer Tow Connector warns the driver about connectivity problems. With the Pro Trailer Backup Assist, reversing with a trailer attached to the truck is easier and safer. That capability shows with the maximum payload capacity, which is rated at 3,270 pounds (1,483 kg). You can really load up the bed, and the available BoxLink system helps you keep things organized and secured down. You can also get a remote tailgate release, a tailgate step, stowable loading ramps and more. Trails are no match for the Ford F-150 with the optional four-wheel drive. With the turn of a dial, the electronic shift-on-the-fly system lets you cycle through different modes. An automatic four-wheel-drive system is included on Lariat, King Ranch, Limited and Platinum versions of the truck. The optional FX Off-Road Package outfits the truck with an electronic-locking rear differential, hill descent control, skid plates and shock absorbers tuned for off-roading. Check out these and more options in person by scheduling an appoint with our dealership. ﻿Contact Us to Test Drive a Ford Today!